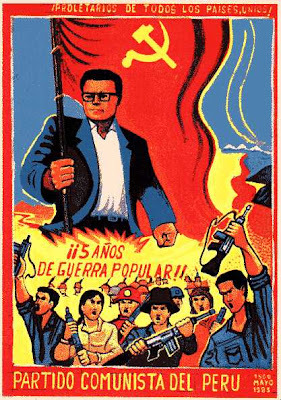 Peru's Maoist Shining Path guerilla movement appears to be making a comeback. In numbers, the guerrillas' ranks remain a fraction of their former size: 400 to 700 full-time fighters in the branch that insists on armed struggle, according to various estimates; in the low thousands if offshoots that call for more-peaceful political revolution are included. Meanwhile Shining Path supporters held a conference in Hamburg FRG in October. Greetings came from Sweden, FRG, Turkey, Chile, Colombia, Spain, Italy and the USA. 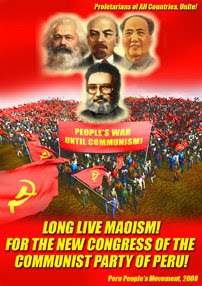 They included messages from groups from both inside and outside the Shining path support organisation, the Revolutionary International Movement, but excluded the US Revolutionary Communistparty, Shining Path's long time American ally. Here is a message from the US based New Peru Friendship Association. It is the PCP, through its generated organization for the work abroad, the MPP, who has been imposing, and will continue to impose Maoism as the only command and guide of the World Proletarian Revolution within the International Communist Movement and the RIM. What corresponds to today is the necessity for militarized Marxist-Leninist-Maoist communist parties to wage and continue to wage people’s wars until communism. And what is fundamental to people’s war is Power. The conquest of power in Peru is materialized in the People’s Committees, Support Bases and the People’s Republic of New Democracy in formation for establishing the People’s Republic of Peru. This is the line of the PCP. It is the Maoist line. The line of the new revisionism, headquartered in the USA, but having terrible consequences around the world, like in Nepal, for example, is “peace accord”. These capitulationist creatures of the new revisionism are united with the genocidal wars that Yankee imperialism and the reactionaries wage against the peoples of the world. They foment and spread capitulation with the so-called “peace accords” for afterwards wanting the revolution to be drowned in blood. They want communist parties without Maoism, without Great Leadership, without people’s war. We are sure that all of this revisionist dead weight will be removed like the cancer that it is and we are honored to be able to help, because it has been poisoning the ICM for far too long. It is not conditions in the world that have held us back—which the RCP claims—but it is them, the new revisionism, that has held us back—their “peace accords”, their capitulation, their treason against the class. Let the RCP participate in the Yankee imperialist elections—that’s exactly where they belong. DOWN WITH THE NEW REVISIONISM! God help Peru, if these people ever take power. Great to hear from you Mike. Will link over weekend. How are you? I've often asked Brian nicolle how you were getting on. Aye Mike-Stephen not getting in was the one downer on a very good night. It is a race isn't it? imagine how stuffed we would be without the internet. There is a film called "The Dancer Upstairs" about the Shining Path.